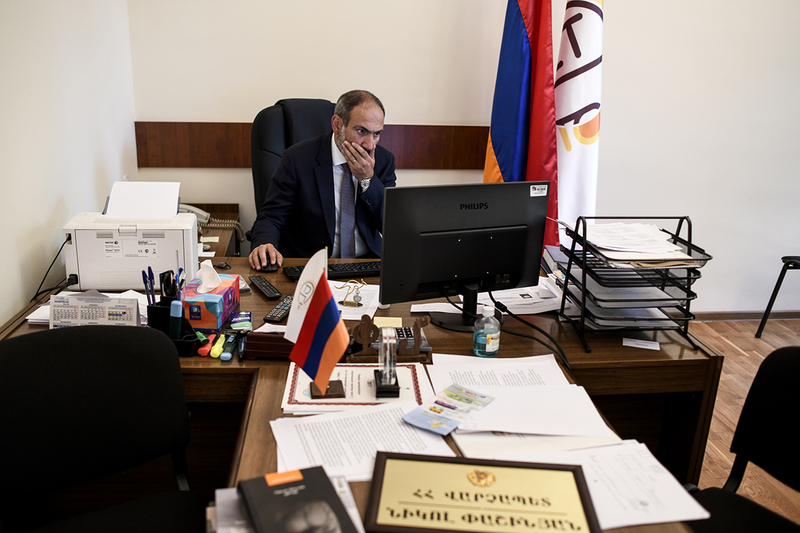 Armenia's new prime minister Nikol Pashinyan has formed his first post-uprising government, a mixture of liberal allies, technocrats, and holdovers from old guard parties that helped him take power. The appointments reflect the delicate political compromises Pashinyan has had to make in the early days of his premiership, but do little to illuminate his vision for what goals he wants to achieve to strengthen Armenia. The core members of Pashinyan's new cabinet are close associates from his Civil Contract party and its allies in the Yelk bloc, their small parliamentary faction. Four of the nine Yelk MPs now have cabinet positions. These new ministers have no experience in the executive branch of government. Most of them are young civil society activists and scholars fluent in both Russian and English. They include First Deputy Prime Minister Ararat Mirzoyan, 39, a founding member of Civil Contract and a Yelk MP. Mirzoyan has appeared to take the lead in the sensitive issue of how to deal with the country's political prisoners – mainly hardline opponents of the old regime whose supporters have been putting pressure on the new government to release them. Another deputy prime minister, 29-year-old Tigran Avinyan, is a Yelk city council member and senior Civil Contract figure who is expected to focus on the economy and foreign relations. In the days following his appointment, he accompanied Pashinyan to a summit of the Eurasian Economic Union in Sochi, Russia, and then headed Armenia’s delegation to the Astana Economic Forum in Kazakhstan. In his acceptance speech after being elected, Pashinyan promised that “more women need to be included in governance.” But Pashinyan has faced early criticism for appointing only two women among a total of 20 cabinet members. Both women are from his close circle of allies: Minister of Labor and Social Affairs Mane Tandilyan, 39, a Yelk MP, has worked as an accountant for various Yerevan startup companies and an investment fund. Minister of Culture Lilit Makunts isn't a member of any political party but has been close to the Civil Contract leadership. Perhaps the most controversial of Pashinyan’s appointments from among his allies is Diaspora Minister Mkhitar Hayrapetyan, a 28-year-old Civil Contract activist. Pashinyan has made renewing ties with the large Armenian diaspora a priority, in particular working with business elites from diaspora communities who could bring much-needed investment into the country. One of Hayrapetyan's first moves as minister was to propose the adoption of a bicameral parliament in which one chamber would be made up of diaspora representatives. The idea struck many observers as irrelevant. “I’d rather not pay attention and spend energy and resources on ideas that are unnecessary and difficult to execute,” wrote Areg Galstyan, a Yerevan-based political scientist who studies the Armenian diaspora, in a Facebook post. For the power ministries, Pashinyan went with safe picks from within the ranks of the previous government. Foreign Minister Zohrab Mnatsakanyan is a 52-year-old career diplomat who most recently served as Armenia's ambassador to the United Nations. Before that, he was deputy foreign minister and chief negotiator of the association agreement with the European Union that Armenia ultimately failed to sign in 2013 (it instead opted for the Russia-led Eurasian Union). Defense Minister David Tonoyan, 51, had been first deputy defense minister and then minister of emergency situations in the previous government, and also has held various positions at the NATO Allied Command Staff headquarters. Pashinyan filled out the ranks of many of the other ministries with officials from the two parties who helped ensure his election and with whom Yelk is now likely to form an alliance in parliament. The Prosperous Armenia party was granted four portfolios: the ministries of energy, transport and communications, emergency situations, and sports and youth affairs. Perhaps most critically, the party got a deputy PM who is expected to oversee economic development. Mher Grigoryan, 46, once served as chairman of Ardshinbank and Armenia Insurance, two companies controlled by a murky Russian aerospace mogul, Karen Safaryan. Ardshinbank is also connected to Armenia’s former premier Karen Karapetyan, who served on its board of directors and once owned a small share in the bank. “A new Armenia cannot have as a minister a person who justified and incited hate,” wrote Vahan Bournazian, a Yerevan-based human rights activist, in an op-ed on Minasyan's appointment. Pashinyan also set aside a few relatively senior positions for leaders in the “Reject Serzh” movement who formed a key role in mobilizing young people in the April-May protests. Armen Grigoryan, a longtime activist and member of the Transparency International Armenia chapter, was named secretary of the National Security Council; while David Sanasaryan was appointed head of the State Oversight Service, a watchdog under the office of the prime minister. Pashinyan didn’t give any specific timeline for holding an election, but according to two sources with knowledge of the matter, he and his allies are aiming for a September vote.